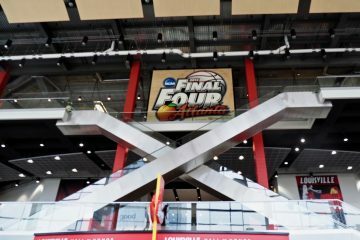 Facing their highest ranked team of the season so far, the #12 Louisville Cardinals (28-8, 13-5) absolutely dominated the #2 NC State Wolfpack (29-8, 12-6) all weekend, as Louisville swept the Wolfpack for their fifth sweep of the season and third in conference play (Duke, Wake Forest). The offense appears to have finally hit their strides, as they put up their biggest numbers of the season. As a whole over the three games, they tallied a whopping 47 hits while batting .379 and plated 34 runs. Their clutch hitting was outstanding, as they went .370 with runners in scoring position and .342 with 2 outs, including going 7-16 with 2 outs in game 3 alone. The Cardinal Nine was paced by juniors Tyler Fitzgerald and Logan Wyatt, as well as freshman Alex Binelas. The trio combined to go .405 at the plate with 3 home runs, 18 RBIs, 4 walks and 6 doubles. Binelas by far had the best weekend of them all, tallying all 5 of his RBIs in game 1, batting 7-12 (.583) with a home run, 3 walks and 3 doubles, including his first career multi-double game in game 3. As expecting, the pitching staff struggled at times with the high-flying NC State offense, allowing 15 earned runs off 20 walks and 24 hits over all 3 games. 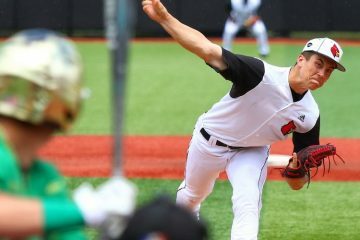 On the plus side, the starting rotation was the best aspect of Louisville’s pitching over the weekend. Reid Detmers and Nick Bennett both racked up 8 strikeouts in their respective starts, and Bobby Miller keeping NC State off the board in the first 5 innings of his start. Kicking off their second consecutive road series, the Cardinal Nine absolutely exploded at the plate in a game where all but two hitters had multi-hit games. Their 14-10 victory in which they collected 18 hits were the most runs and hits generated by the team all season, with three players matching their career highs (Campbell, Davis, Lavey: 3). 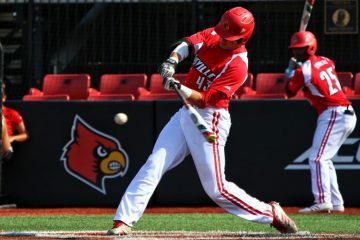 Like they have for the majority of the season, the Cards scored early and often in game 1 of the Saturday doubleheader against the Wolfpack. A groundout RBI from junior first baseman Logan Wyatt in the first inning and an NC State error with the bases loaded in the second plated Louisville’s first couple runs, but the third inning is where things really took off for the Cards. 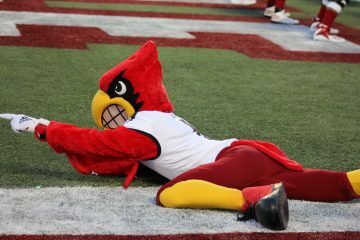 Louisville would match their highest scoring inning of the season with a 7-spot in the third inning. Freshman third baseman Alex Binelas would strike a 397ft, 3 RBI home run for his team leading 5th long ball of the year to get the inning’s scoring started. Following that up would be back-to-back 2 RBI base hits, with a single by junior shortstop Tyler Fitzgerald and a double from Logan Wyatt. The Cardinal Nine wasn’t done yet though. They’d put up yet another crooked number inning in the sixth, plating 3 runs. Sophomore designated hitter Zach Britton & junior third/second baseman Justin Lavey would both register RBI singles, with another run being sent home off an NC State throwing error following a single from junior outfielder Drew Campbell. Meanwhile on the mound, sophomore southpaw Reid Detmers had a similar outing than what he had against Clemson, with the difference this time around is that he actually had run support from the hitters. 3 of his 5 earned runs over his 5.2 inning start came off of home runs. However, he was able to strikeout 8 NC State batters while only allowing 3 walks. It wasn’t until a 2 baserunner/2 out jam in the sixth and 116 total pitches that Dan McDonnell decided to remove him from the game. He’d insert freshman Jared Poland to finish the inning, drawing a groundout to get out of the jam. Though the Wolfpack would eventually get back on track and plate half of their runs in the contest in the final 3 innings of play. Following a two leadoff walks and a double to send them both home, Poland would get yanked as well after only retiring a single batter in his relief appearance. Junior lefty Adam Elliott would relieve him, only to give up an RBI triple and sacrifice fly himself. Coach Mac would have to go to the bullpen for a second time and insert the fireballing righty Michael McAvene with two outs, where we would load the bases to give NC State a fighting chance, but subsequently strikeout the final batter of the inning. Louisville finished their scoring efforts in the eighth inning thanks to a single swing of the bat. Nabbing a multi-RBI base hit for the second time in the game, Alex Binelas cleared the bases yet again this time on a 2 RBI double. His 5 RBIs in the game would not only set a career record for himself, but also be the most RBIs by a Cardinal in a game since Logan Wyatt’s 7 RBIs vs. Kent State on June 1, 2018 in the Lubbock Regional. Those two insurance runs from Binelas in the eighth proved to be for naught, as Michael McAvene did a serviceable job from the mound to close the game. Over his 2.1 innings and 9 batters faced, he only surrendered 1 run in the eighth while striking out 3 batters. Because of the situation he was inserted to in the seventh, he would also post his team-leading 4th save of the season. Plating 14 runs on 18 hits for the second straight game, this time around the Cards did so while simultaneously keeping the NC State batters in check as they cruised to 14-2 victory to clinch the weekend series against the Wolfpack. All of the batters in the starting lineup notched a base hit, with Alex Binelas setting a career high with 3 after setting a career high in RBIs the previous day. While they didn’t score in the first inning, the Cardinal Nine still went on an absolute tear as they plated the game’s first 12 runs. The Louisville scoring efforts began in the second inning, kicked off by RBI base hits from outfielders freshman Trey Leonard and junior Jake Snider, with Leonard’s coming off his first career triple. 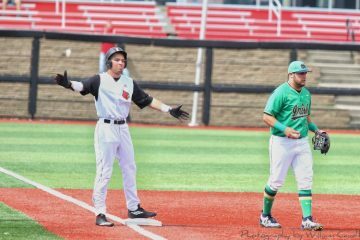 The fourth inning is where Louisville really broke things open, as they once again were able to match their highest scoring inning with 7 runs in the fourth. Drew Campbell and Logan Wyatt would collect RBI singles, with Justin Lavey’s RBI single plating 2 runs. Though the biggest moment of the game belonged to Tyler Fitzgerald, as his double with the bases loaded sent all the baserunners home. Continuing to build their lead, Louisville piled another 3 runs onto the Wolfpack in the sixth. Logan Wyatt would launch a solo shot for his 4th home run of the season, with a groundout RBI from Drew Campbell and an RBI double from senior catcher Zeke Pinkham providing the inning’s other two runs. NC State would not crack the scoreboard until the bottom of the sixth, thanks to a 2 run home run surrendered by junior left-hander Nick Bennett. Other than this at-bat, Bennett had done a great job keeping the Wolfpack hitter at bay. Though he allowed 6 hits and 4 walks, he had a bend but not break mentality and was also able to strikeout 8 batters, the same as Reid Detmers had struck out earlier that day. Louisville would respond to NC State’s 2 runs with 2 more runs of their own immediately afterwards. A sacrifice fly from Tyler Fitzgerald and groundout RBI from Logan Wyatt would be the last runs plated in the game, with Fitzgerald’s sacrifice fly matching his career high in RBIs of 4. 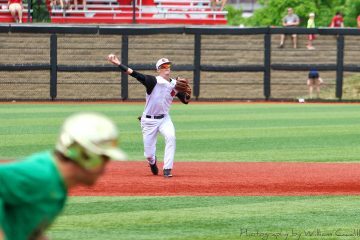 Once Bennett made his exit from the game, Jack Perkins did just as good of a job as him in keeping the Wolfpack off the base paths. In his 3.0 inning save, he only surrendered 1 hit and 1 walk while striking out 4 batters. It was also his first career collegiate save, and the first time that Louisville posted a save in consecutive games since doing so in all three games against Wake Forest earlier this season. Making a last ditch effort to avoid being swept at home, the Cardinals held off the Wolfpack just long enough to complete the three-game sweep of the top 5 team. Unlike the doubleheader games the day before, the series finale in Raleigh, NC turned out to be for the most part a pitcher’s duel. Like in both doubleheader games the day before, Louisville was once again the first team to crack the scoreboard. A sacrifice fly in the third from Jake Snider and a groundout RBI in the fourth from Logan Wyatt gave Louisville their first couple runs of the game. 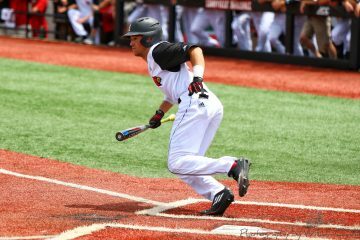 As the game progressed into the later innings, freshman catcher Henry Davis drove in Louisville’s third run of the game in the sixth inning. The latter two of these three runs both sent home Alex Binelas, who had reached base both times via the double, good for a career high in two baggers. For the first 5 innings of the game, starting pitcher Bobby Miller had a very solid outing against the Wolfpack. While he only struck out 3 batters, he only allowed 2 base hits as NC State could not quite square up to the pitches that he was offering. Unfortunately, three straight walks to begin the sixth inning would spell the end of his outing on the mound. With the bases loaded and no outs, newly inserted pitcher senior Bryan Hoeing faced the toughest jam a relief pitcher can face. But he aced it, striking out a pair of batters and grounding out the final batter to end the inning. 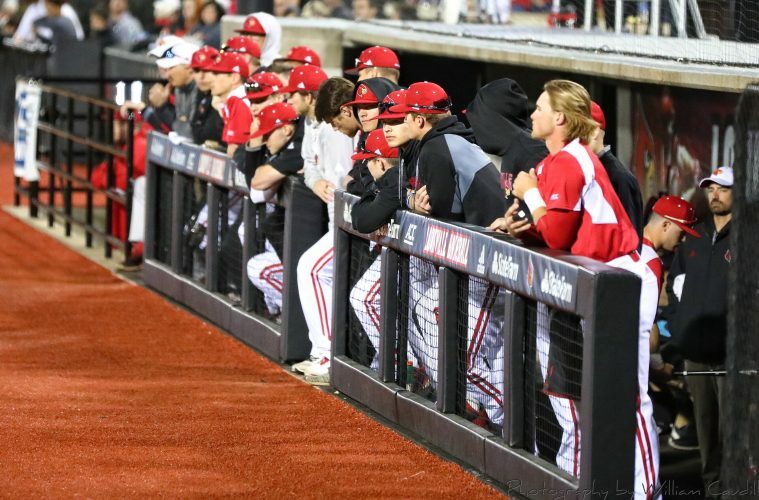 Louisville responded to the near-big inning by NC State with Tyler Fitzgerald’s fourth home run of the season in the top of the seventh, but the bottom of the seventh saw more successful results from the Wolfpack. Hoeing would surrender NC State’s first 2 runs of the game, but like the Cardinal Nine had done all weekend, they responded in a big way. Sophomore leadoff hitter Lucas Dunn drove in his first RBIs of the weekend with a 2 RBI base hit to extend the lead back out to 4. Closing out the game and the series, relief pitchers Shay Smiddy and Michael Kirian combined for 3 strikeouts over the final 2.0 innings pitched and surrendered only 1 walk in the eighth and 1 run in the ninth.